Design matters. In the design of cohousing, intention also matters. What sets cohousing apart from other types of conventional housing models - whether it is single family neighborhood, condominiums, or apartments - is that in cohousing, there is a physical space that is the heart of the community, and that space is the Common House. It is the stage in which community life (and intention) plays itself out. While most common houses have the same programmatic elements - a dining room, kitchen, kids play room, and laundry, I would argue that they are not all created equal. The success of a Common House results from the careful juxtaposition of the above programmatic spaces and how they relate to each other. And the intentionality behind the design of each room also lends to the success. After having visited over 80 cohousing communities in the past 8 years my measure of a successful common house is how often its rooms are used by the community. During my visits to cohousing communities I have seen some rooms that were seemingly well designed, but were reported by residents to have received little usage due to poor acoustics, lack of visual connection, uncomfortable furniture, poor lighting, etc. I have also seen rooms that were clearly designed as a "multi-purpose" space - and therefore, it serves no single purpose well. 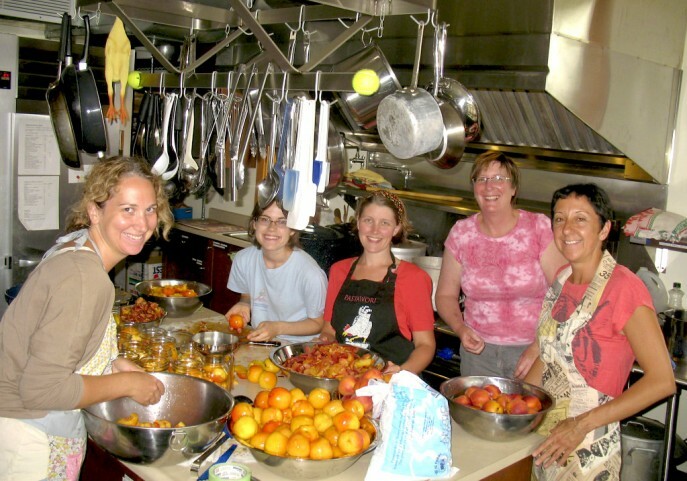 I acknowledge that space is often a premium in cohousing (either due to physical constraints or budget) and that the Common House needs to support a diversity of programmatic uses – large events, community dinners, canning of summer harvest, a musical combo. I would argue that a well-designed Common House will contain rooms that are well suited for the uses programmed for a given space while still allowing future flexibility for how that space might be adapted for another use. How is this achieved? Through careful application of patterns - as enumerated by Christopher Alexander in his seminal book A Pattern Language. In 2006, I used Alexander's book as the basis of codifying the essential elements of Common House Design and created some additional patterns that I felt were important to better accommodate the intentionality of cohousing communities as I had observed in Denmark. It was apparent that the Danes had been more concerned about the specific uses of each space and not so much on each space needing to satisfy a litany of multi-purposes. And thus, their Common Houses had an air of hygge that is less frequently found in the Common Houses I have experienced in North America. Designing the Cohousing Common House is the title of the book I wrote to document my findings of Danish Common Houses. The book includes, in addition to my own, Alexander’s patterns. My book has been requested by architects designing their first cohousing community, students researching cohousing, and residents who are planning for the design of their common house - these requests have come from across the US, as well as from Poland, Australia, Belgium, and England. It is available for purchase by contacting Schemata Workshop. In addition to the book, and if you are interested in learning more, I would encourage you to attend my workshop on Common House Design at the National Cohousing Conference in Oakland, CA. 1-5pm on June 15, 2012. Daybreak Cohousing gets its first art! [caption id="attachment_3664" align="aligncenter" width="687" caption="Daybreak's mural"] [/caption] When we designed Daybreak Cohousing, the residents wanted to incorporate some art on the buildings. However, as the project progressed, there was neither time or budget to create the pieces prior to move in so it was decided to wait until the residents moved in. The railing system was designed to allow for replacement of wire mesh with art panels. A concrete wall at the terrace stood ready to receive a mural or artwork. Blocking was placed at key points on the building facades to receive large hanging pieces – these were structurally reinforced and fully flashed to integrate with the exterior siding. [Then] Daybreak resident and graphic artist Maura Jess conceived and designed the mural inspired by two pottery pieces created by fellow Daybreak resident and ceramic artist Scot Cameron-Bell. Scot later joined the project and transferred the design outline to the wall and the two artists then worked closely with other residents to paint the image over a 2-week period, Scot applying the final artistic touches.. So, after almost 2 years the first piece has been installed! Click here to see photos of the process, including the inspiration for the piece.